It didn't come together until the final year. 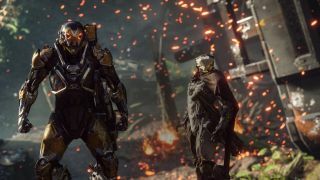 Anthem took so long to come together that it was still called 'Beyond' just days before the E3 2017 reveal, according to a report from Kotaku. Speaking with 19 people involved in or close to the game's development, the report paints a grim picture of the RPG studio and the creation of its disappointing looter shooter. That's another thing that wasn't settled on straight away, apparently. Some core bits are familiar—the Iron Man suits, a mysterious world—but all the grinding for gear would come much later. Instead, there were elements which almost had a survival bent, including procedural combat encounters, dynamic weather and a more complicated ecology. “You’d be out somewhere, and an electrical storm would happen at random, and you had to survive it," one developer told Kotaku. "We had an early demonstration of this where the environment was dynamic and by pulling levers we could change it from summer to winter to fall." Flying, probably the most popular feature, was removed and added back in several times over the course of development. Even in 2017, flying was up in the air. The report claims that, after a disappointing demonstration for EA's Patrick Söderlund, flying was finally put back into the game only weeks before E3. It was still Beyond at that point, apparently, and then a few days before the big reveal, the name was suddenly changed. “Everybody was like, ‘Well, that doesn’t make any sense—what does this have to do with anything?’” Kotaku was told. Though not especially memorable, there was clarity to the original name. Anthem didn't have an obvious meaning, at least not in relation to the game. That wouldn't happen until the story was developed and all the Anthem of Creation lore was conjured up. After E3. "The demo was not actually built properly—a lot of it was fake, like most E3 demos," one developer said. "There was a lot of stuff that was like, 'Oh are we actually doing this? Do we have the tech for that, do we have the tools for that? To what end can you fly? How big should the world be?'" When it was given a Fall 2018 release window, barely a single mission had been implemented, and by the start of 2018, only one mission was actually in the game, according to someone who worked on Anthem. It was only in 2018 that the game started to become what we got to play this year. There are echoes of Andromeda's development, which was plagued by similar issues and had a similarly disappointing reception at launch. If the picture this report paints is accurate, it reveals a lot of serious issues at BioWare that go back years, further than the development of either games. While it declined to comment, BioWare has responded with a statement, in particular defending against allegations of crunch and an unhealthy work environment made elsewhere in the report.